This is our dinner foods which are a combined potluck from all who attended, it's actually a dinner with bestfriend JennyL and some of our friends way back in school days. I brought Andok's Liempo and JennyL brought drinks. 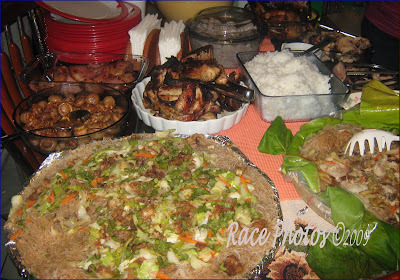 Some of our friends brought pancit, cake and salad. It was a mixture of various foods without really organizing who will bring this and that. Anyway even if some foods are the same we enjoyed the evening with our friends. Happy Food Friday to all, see other delicious food here! Natatakam ako dun sa pancit. My Food Friday is now up HERE. Happy weekends! nakakagutom! nagta-try pa naman ako maglimit ng food intake *sigh*. nga pala, did you see the award that I had passed on you. Wow, sarap nito ah. I like pancit and pork liempo.